Newcastle United have signed French trialist Fabrice Pancrate until the end of the season, with the option to extend the deal. The 29-year-old winger has been training at the club since his release by Paris Saint Germain in the summer. He impressed during the 3-2 reserve win against Hartlepool on Tuesday. Pancrate will have to wait for his registration to be ratified before learning if he can play against Preston in the Championship on Monday. 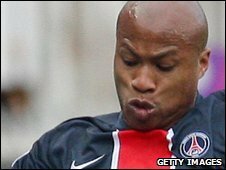 The Frenchman, who has been handed the number 21 shirt by Newcastle, played 91 games while at PSG, and has enjoyed spells at Guingamp, Le Mans and Sochaux as well as Spanish side Real Betis. The Magpies had been seeking cover on the flanks following the departure of winger Damien Duff to Fulham earlier in the season. Argentina's Jonas Gutierrez and Peter Lovenkrands are the side's recognised wingers, although the Dane is also used as a main striker.